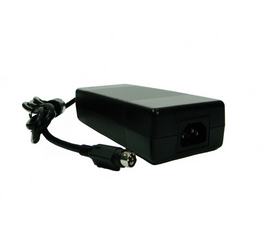 This series of AC/DC switching power supplies are for 120-135 watts of continuous output power. They are enclosed in a 94V-1 rated polyphenylene-oxide case with an IEC320/C14 or IEC320/C18 inlet to mate with interchangeable cord for world-wide use. All models meet EN55011, EN55022 and FCC class B emission limits, and are designed for medical and ITE applications, not for life-supporting equipment. 1. Class I models are equipped with IEC320/C14 inlet, and class II models with IEC320/C18 inlet. 2. For 10 seconds maximum, average power not to exceed maximum power rating. 3. Ripple and noise is maximum peak to peak voltage value measured at output within 20 MHz bandwidth, at rated line voltage and output load ranges, and with a 10 μF tantalum capacitor in parallel with a 0.1 μF ceramic capacitor across the output. Class I models are to be certified to medical and ITE safety standards, Class I I models to medical standards only.